ROSTOV-ON-DON, Russia — Following a tumultuous and at-times controversial journey to the knockout stage, Japan came close to reaching their first-ever World Cup quarterfinals on July 2 before having their hearts broken by a last-gasp Belgium goal. In a turn of events few would have predicted, the Samurai Blue fought their way to a 2-0 lead against their star-studded opponents after 52 minutes in the last-16 clash at Rostov Arena. Though substitute Nacer Chadli eventually seized a 3-2 victory for the world No. 3 side with the penultimate kick of the game, Japan’s spirited performance earned them plaudits and all but swept away criticism about how they reached the knockout stage. Down 1-0 against Poland in their final group-stage match, coach Akira Nishino and his men invited derision by forgoing any attacking moves as they relied upon the “fair play” tie breaker to secure their first knockout stage berth in eight years. 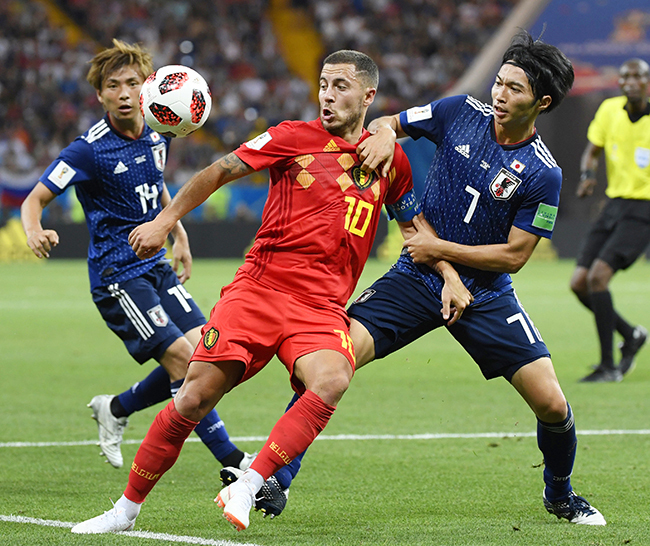 The jeers that rang out at Volgograd Arena were a distant memory on the night of July 2, however, as the team dubbed “Old Man Japan” almost went the distance with a Belgium side boasting one of the most talented squads at the tournament. They may have fallen short of their stated goal of a quarterfinals berth, but the team’s overall performance unequivocally vindicated the Japan Football Association’s decision to fire former head coach Vahid Halilhodzic just two months before the tournament. The JFA justified the shock move by saying the Bosnian had lost the confidence of his players. In replacing him with former technical director Nishino, they opted for a head coach known for his ability to form a strong rapport with his charges. A J-League and Asian Champions League title winner as boss of Gamba Osaka, Nishino was hailed for orchestrating the “Miracle of Miami” at the 1996 Atlanta Olympics, when Japan pulled off a 1-0 upset against a Brazil side boasting the likes of Ronaldo, Rivaldo and Roberto Carlos. Drawing criticism for omitting a number of up-and-coming players, Nishino put his faith in age and experience as he assembled Japan’s oldest-ever World Cup squad. The start of Japan’s Group H campaign was beyond the predictions of all but the most one-eyed fans, with the team grinding out a 2-1 win against a 10-man Colombia in Saransk. Though hard to imagine them beating the eventual group winners without the third-minute red card for Carlos Sanchez’s deliberate handball, the “old men” showed their poise and experience in sealing the victory. Japan’s most impressive performance of the group stage, however, came in their 2-2 draw with Senegal, when the four-time Asian champions outplayed for most of 90 minutes a side that had convincingly beaten group favorites Poland. While Japan garnered criticism for their negative tactics against Poland, which saw them finish ahead of Senegal on account of having fewer bookings, the knockout-stage berth ultimately outweighed any bad publicity. For all but 10 minutes of the tournament, Nishino’s side attempted to play a positive brand of attacking football that entertained spectators and brought Japan within inches of their first last-eight berth. While set-piece defense continued to be a weakness and may have ultimately cost them a place in the quarterfinals, the bright aspects of Japan’s campaign were greater than the negatives. A number of players had breakout tournaments, chief among them attacking midfielder Takashi Inui, now with a pair of World Cup goals to his name, while veterans Keisuke Honda and Shinji Kagawa showed they still had plenty left in the tank in what was likely their final appearance on this stage. In the wake of the round-of-16 heartbreak, Nishino said Japan could not call its World Cup a success. But after far exceeding expectations and producing several moments of outstanding football, the team should take a sense of accomplishment from tournament.